A little something for the holidays! 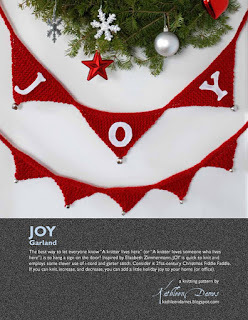 I dubbed this garland "JOY" because it came out even better than I thought it might. You see, I had this idea of using i-cord, and then it all fell into place. This is knit in one piece (oh, joy! ), and I didn't even weave in the ends, just trimmed them to an even length so they could be used to hang the garland. It comes in two sizes, and the pattern includes templates to cut out felt letters to spell JOY, PEACE, MERRY CHRISTMAS, HAPPY HANUKKAH, and HAPPY NEW YEAR, large and small. My JOY garland hangs on our front door, makes me smile every time I see it (I seek out peace and joy all year round), and gently jingles when the door opens or closes (and we all know what happens every time a bell rings, don't we?*). So, share some joy this holiday season (or work it up in other colors for festive bunting any time). If you can knit, increase, and decrease, you can have some joy in your life. I've included instructions for making i-cord, if you've never done it. The pattern may be purchased through Ravelry or on Etsy, or you can use the handy button below to buy instantly. *"Every time a bell rings, an angel gets it's wings," according to It's a Wonderful Life. Whether you believe in angels or not, jingle bells are a merry sound.